Situated on San Marco Avenue in historic St. Augustine, the Oldest Store Museum offers a unique experience seeing some of the most incredible items created at the turn of the 20th century. 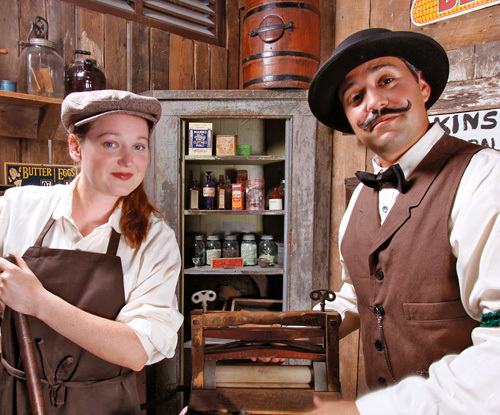 Visitors can watch actors portray clerks, snake oil salesmen and butchers while showing you items like a steam-drive tractor, a grain thresher, guns and ammunition, tonics and elixirs, and more. Watch in amazement as the friendly clerks, butcher and snake oil salesman demonstrate the very latest inventions for turn of the century living. Items such as a goat-powered washing machine and a gas powered iron! Its truly like walking into a Sears Roebuck catalog from 1908. Meet the proprietor: Mr. C.F. Hamblen and watch in amazement as the friendly clerks, butcher and snake oil salesman demonstrate the very latest inventions for turn of the century living. The local actors/storytellers make this tour even more entertaining by providing history and humor all rolled into one. They are recognized for their ability to captivate and entertain guests, as they share a common enthusiasm for history and talent to amuse folks.